The Nigerian presidency has overruled the Inspector General of Police, Suleiman Abba, and has ordered the immediate redeployment of Tunde Ogunsakin, an Assistant Inspector General of Police, out of Rivers state, for allegedly failing to do the bidding of the Peoples Democratic Party, people familiar with the matter have told PREMIUM TIMES. The Nigeria Police had on Thursday deployed senior police officers to oversee governorship and state assembly elections in states considered as the likely flash-points on Saturday. Assistant Inspectors General of Police were deployed to supervise elections in 16 states, including Rivers, Akwa Ibom, Lagos, and other potentially troubled spots, a statement from the force had said Thursday. Mr. Ogunsakin, a former police commissioner in the state, and currently AIG in charge of Zone 6, headquartered in Calabar,was asked to return to Rivers to oversee police deployment for the election there. Based on the IGP’s directive, Mr. Ogunsakin left his Calabar base and travelled to Port Harcourt, the Rivers state capital, Friday. On arrival, he reportedly ordered investigations into reports that PDP supporters were thump-printing ballot papers in some locations in the city. “He also ordered that some thugs being positioned to foment trouble be restrained,” a source in the Rivers State Command of the Police told PREMIUM TIMES. Our sources said the AIG rebuffed all efforts by the presidency and the PDP to get him to work for the PDP candidate, Nyesom Wike, in the election. Mr. Ogunsakin could not be reached to comment for this story. Calls to his mobile telephone failed to connect suggesting he might be travelling between Port Harcourt and Calabar. A top police officer at the Rivers Police Command however confirmed that Mr. Ogunsakin hurried out of Port Harcourt Saturday morning following directives from the presidency. Presidential spokesperson, Reuben Abati, did not answer or return calls Saturday morning. 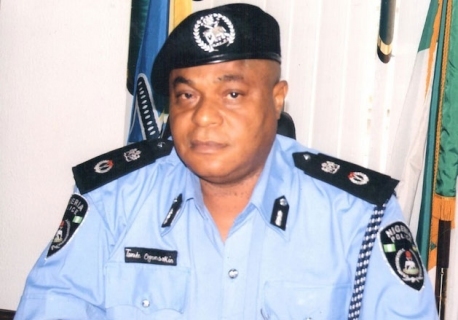 Mr. Ogunsakin,a former head of the police special fraud unit, succeeded controversial police AIG, Joseph Mbu, as police commissioner in Rivers on February 6, 2014. Mr. Mbu was then engaged in a fierce disagreement with the state Governor, Rotimi Amaechi. The face-off between Mr. Mbu and governor worsened after a violent fight in the Rivers State House of Assembly in July 2013. Mr. Amaechi, one of the five Peoples Democratic Party governors who decamped to the All Progressives Congress, then accused Mr. Mbu of colluding with the presidency to undermine his government. He also alleged threats to his life by the then Police Commissioner and petitioned the Inspector General of Police to redeploy Mr. Mbu. Mr. Mbu, who maintained that he acted professionally, counter-accused Mr. Amaechi of being a dictator. When Mr. Ogunsakin was posted to the state as commissioner in February 2014, he tried to repair the damaged relationship between the state police command and the Rivers government. Many believed he succeeded, but was redeployed to head Zone 6 after he was promoted AIG. Mr. Amaechi added, “The Rivers State Government wishes to warn all security personnel in Rivers state that Government will not spare any persons found engaging in unwholesome and unprofessional conduct. It wishes to remind all security personnel that the main object of government is to secure lives and properties and it will not relinquish that right. “It also calls on all citizens and residents to take appropriate note and document any security personnel behaving improperly and who is compromised and forward same to the Rivers State Government. All such personnel will face the full weight of the law now and for those who may escape prosecution now, definitely when the new government takes over on May 29, 2015.